I remember the first time I visited Pittsburgh for a news photographers seminar in the 1980s. I was not expecting much, envisioning Pittsburgh as an industrial city with a lot of smoke. Boy, was I in for a pleasant surprise. Pittsburgh is a diverse, picturesque area with great culture, sports and plenty to do. I have been back many times for business as well as for pleasure and the Steel City continues to blossom and now is consistently ranked as one of the top 10 most livable (and affordable) cities in the country. 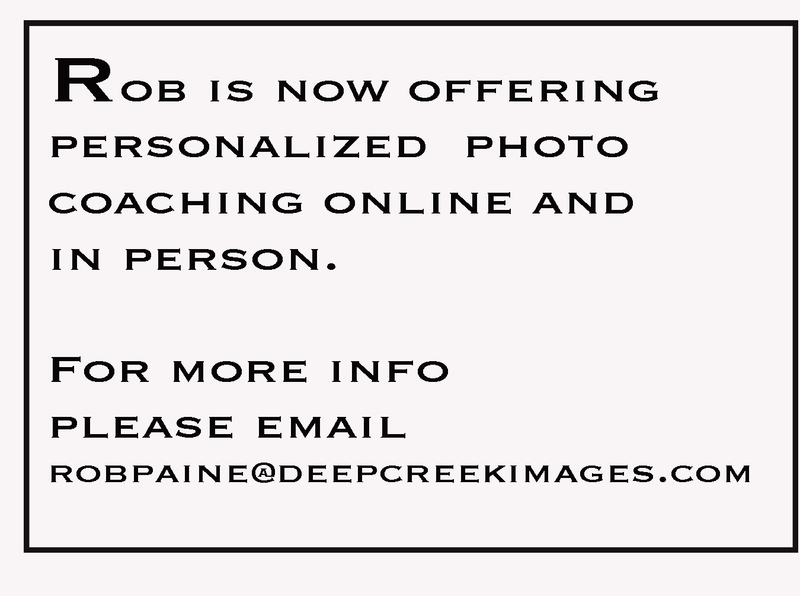 On top of that, it is just about two hours from the Deep Creek Lake area. What more could you ask for? Pittsburgh is home to one of the nation’s best hospitals, has great universities and PNC Park, (home of the Pittsburgh Pirates) arguably the best place to watch baseball anywhere. These photos were taken in Station Square complex in Pittsburgh during a trip I made in June of 2009. I was staying at the Sheraton Station Square. Station Square gives one a great view of downtown and includes restaurants, stores and nightclubs. Station Square also features a colored light fountain show at night and has a train track running along side of it. 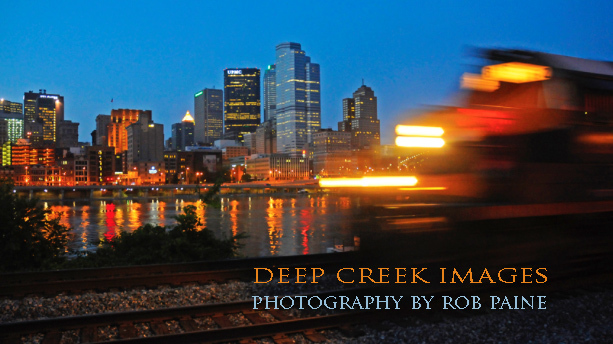 I wanted to get a shot of the city lights with a train in the foreground. The photo above was taken at dusk so I could capture a far amount of ambient light in the background. I did not have a tripod with me so I rested the camera on a railing next to the train track, using a shutter speed of about a 30th of a second so I could include some motion in the photo as the train would be blurred. I took 8-9 shots to get this one and was fairly pleased with the results. 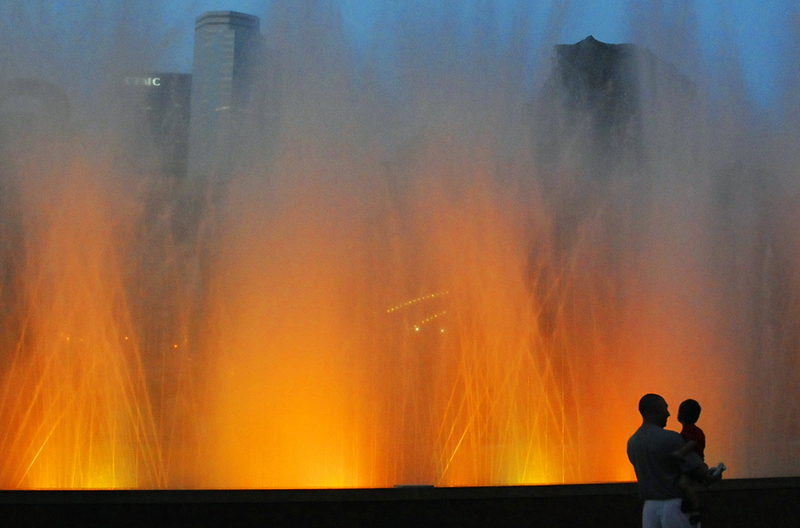 The photo below was also taken at dusk of a dad and son watching the fountain light show, located next to the Hard Rock Cafe in Fountain Square. Day or night Pittsburgh is full of photo opportunities. I love the fountain light show. Interesting shot.